This portion of the central catchment area is not much documented. In fact, there is no "official" trail. 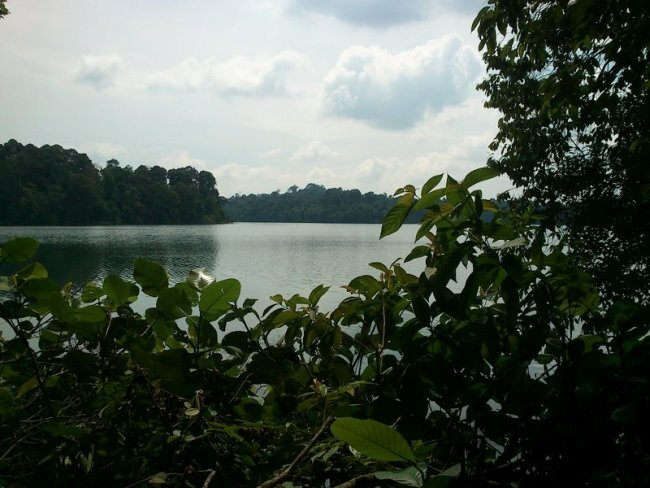 The Upper Pierce Reservoir touches the BKE in the West and the Lower Pierce Reservoir in the East. 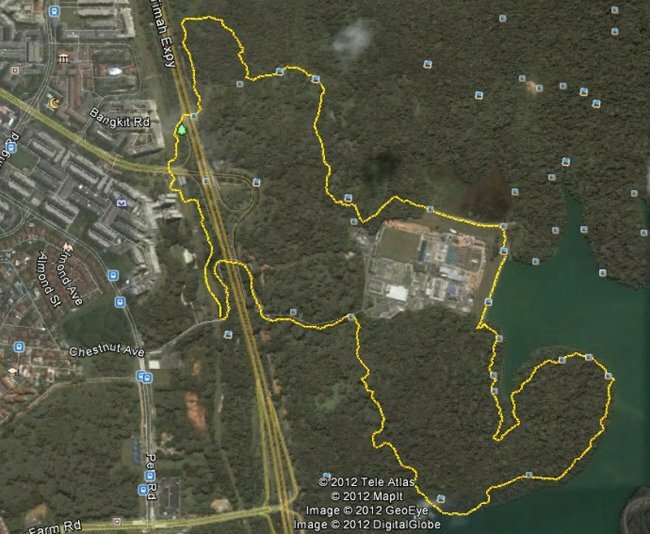 While there are trails as for example the Woodcutters’ trail that cuts the catchment area on this East-West axis, the below trail is following the "shoreline" of the reservoir. The trail is relatively narrow and secluded. Only occasional walkers, anglers or mountain-bikers can be seen there, and early mornings you will be there pretty much alone out there in the wild. By public transport: The closest LRT (not MRT!) stations are Petir or Pending, off Choa Chu Kang. By bus, number 171 or one of the feeder buses off Petir LRT station. By car: The best may be to go up Chestnut Drive and park the car at the roadside. The road is not very much in use as it is a dead end. No official parking here but enough space for a few vehicles especially in the morning, when it is not so crowded yet. In the late morning, cyclists for the mountain bike trail can park here and there may be less space. The track: It is a 7km loop and will be a little tricky to find for the first time. Mostly it is dirt track and at times there are some slopes to climb up. Start off at Chestnut Ave and enter the Zhenghua park heading North. Keep going straight, and cross under the Bukit Panjang road. Shortly after, you will notice a small trail leaving to the right and crossing under the BKE bridge. Continue on that trail, and leave the (abandoned?) community garden on your right, heading up the hill. After a while, you will join a bigger trail. The left turn (heading North) would bring you deeper in the Catchment area and ultimately will terminate at the Singapore Zoo. Turn right here and follow the trail until you see the fence of the Reservoir water facilities. Along that fence or through the forest (follow the mountain bike tracks! ), leaving the water facility buildings on your right, you will soon join the Upper Pierce Reservoir, crossing over some sort of barrage. 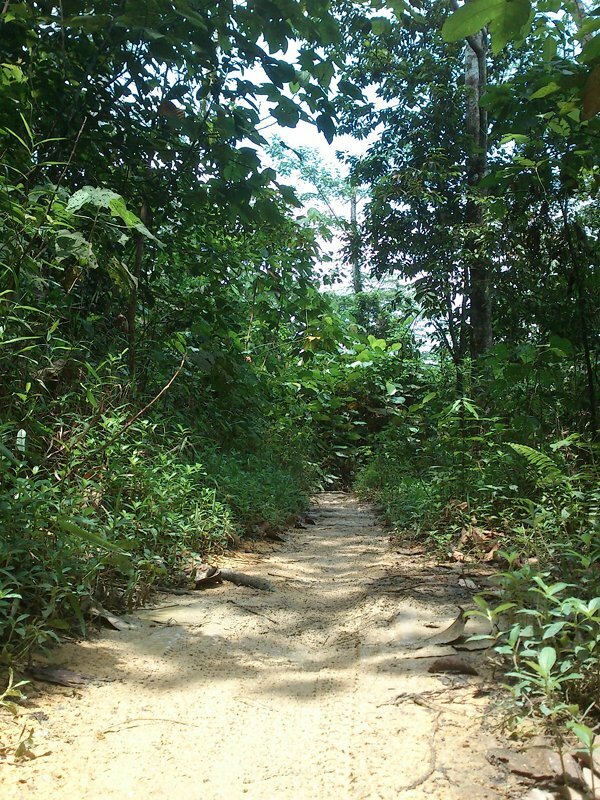 Thereafter, the trail will narrow again and lead you back in the jungle, along the reservoir shore line. Simply follow it all along. The trail will exit at Chestnut avenue, at the main gate of facilities buildings. Continue on Chestnut avenue until you get back to your departure point. After a good tropical shower the trail may be partly quite muddy and close to not passable (at least if you want to return home in a presentable state). 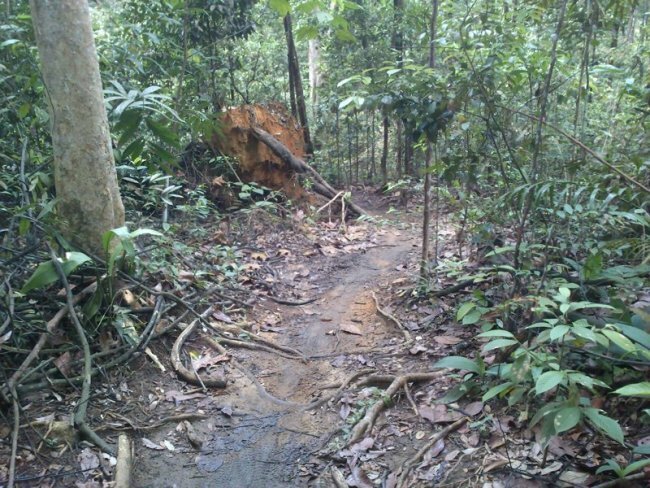 Also, as the place is quite secluded, watch out for all sorts of beasts such as huge monitor lizards, diverse snakes or giant ants.